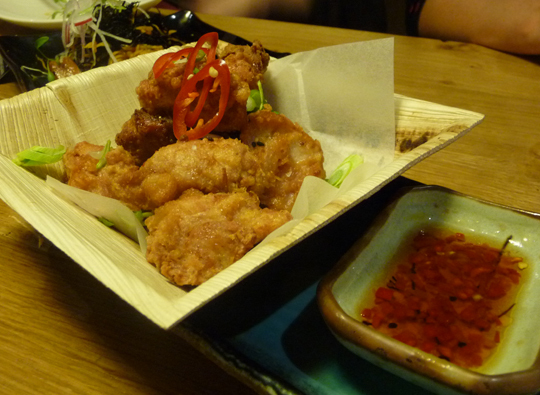 I was positively thrilled to hear about the opening of the new Pan Asian venture by the people behind two very fine Brighton restaurants, Riddle & Finns and Due South (the latter now sadly closed). Known for the high quality of their food, I expected nothing less of their latest venture and luckily it did not disappoint me. Which is great, as had I not been meeting a group of friends, I would have turned right back round again when I was met at the entrance by this enormous Teneriefe-inspired lightbox menu. Worst still, as I still had my jaw dropped, some "oi oi" type came forward with a swagger and clip board. Worringly, I thought he was going to offer me a free vodka jelly shot. Now I get why they feel the need to capture punters like this. The restaurant is in The Lanes, which are a warren to the visitor (and even locals) at the best of times, and the entrance, being set back, is very easy to miss. The restaurants previously on site have been more miss than hit and the location may somewhat be responsible, but seriously, there has got to be a better solution that this. Led up a narrow staircase from the outside to the first floor cocktail bar, things didn't look much better. 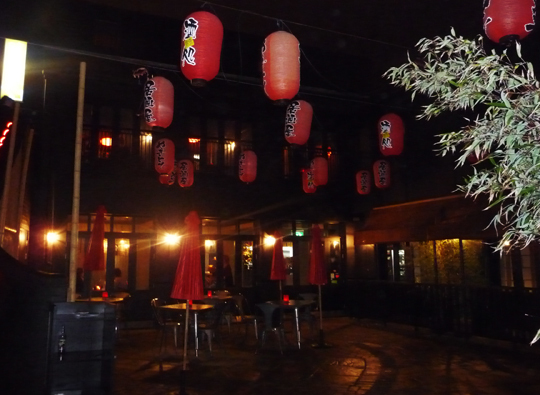 Although the lantern dripped courtyard was charming, the bar fit-out was a bit of an MDF effort, channelling Laurence Llewelyn-Bowen circa 1990s Changing Rooms, not helped by the colour copier cocktail menus and tacky laminated address cards. As the place is "themed" it is a tricky beast to get right, and it almost was, but the finish of the place just missed the mark. Cocktails themselves seemed quite enticing, especially the fusion collection. Shame we didn't get to try any as we couldn't get served in time before dinner. 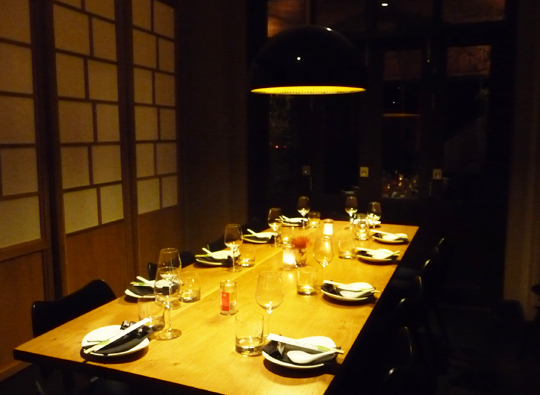 The main restaurant downstairs is far better with a part open kitchen and the three private dining rooms are quite well furnished and cosy, although not that private with rice paper divides. Anyway, the food menu (this one properly printed) is rather exciting. 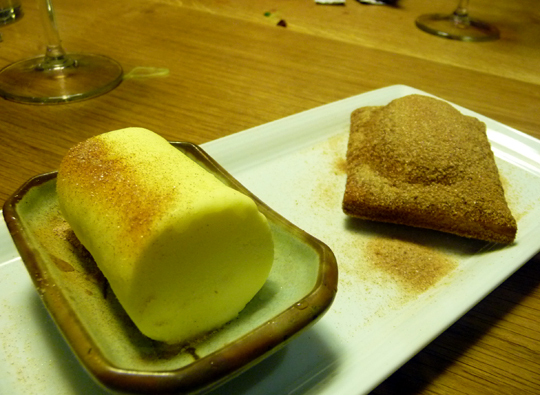 This is small-plate style which is great for tasting but potentially painful on the wallet. As a large group of seven though, it can work out quite well padded out with rice. 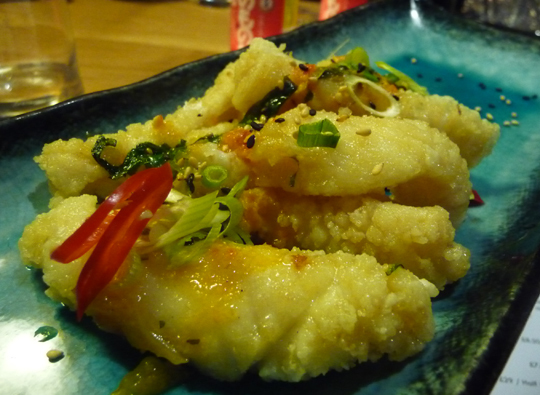 Individually, most dishes are actually well priced at £3-£10 although some items like the Lobster or Black Cod are far pricier at £29 each. Almost everything we ordered was well presented and excellent, even promoting a second order on a few items. 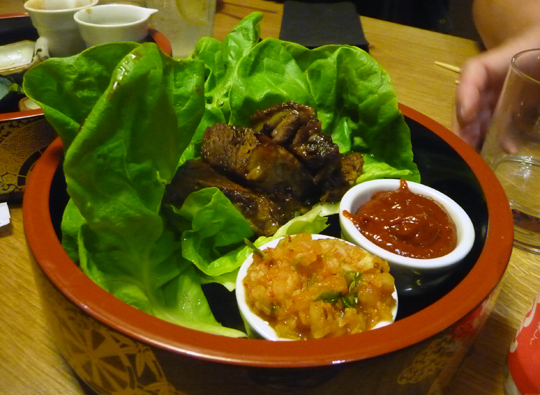 Dishes which shone were the Bo Ssam House Special Beef with Kimichi Puree & Lettuce, which fell apart in tender pieces of tasty gorgeousness. You really needed the lettuce "wrapping" to hold the meat together long enough to pop in your mouth. And being a pickle fan, I really liked the sharp tang the kimichi gave. 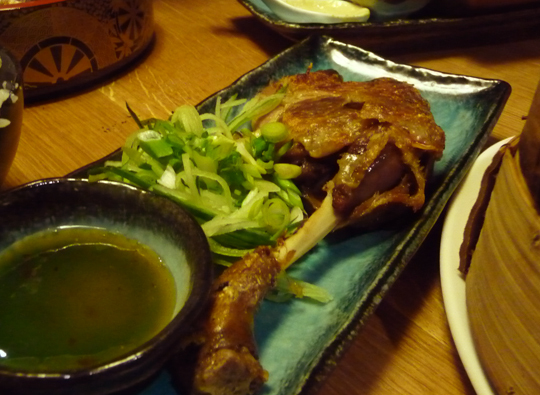 The Roast Duck Leg with Pancakes and Plum Sauce is always a crowd pleaser and the Tori Kara-age Japanese-style Fried Chicken, was finger lickin' good indeed. From the sea were soft, succulent Szechuan Tiger Prawns, and proababy one of the few times I have not been disappointed with squid - this was the best I have ever eaten. 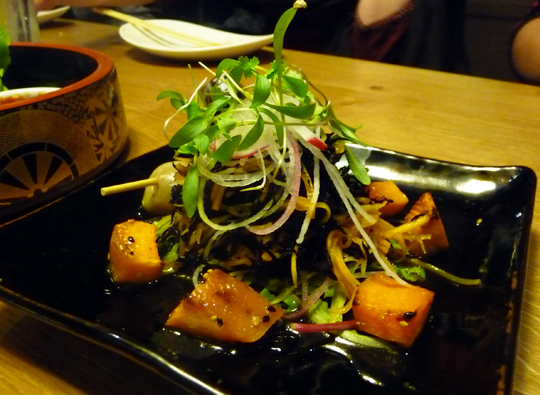 The vegetable dishes didn't play second fiddle, particularly the rich parcel of Sake and Soy baked mushrooms. We were also enticed by the Dim Sum menu and tried the Pork, Chive and Water chestnut buns, the Prawn & Minced Pork Sui Mai and some Vegetarian Gyoza. I'm not much of a Dim Sum lover, these were enjoyable, light and well made and although they didn't knock my socks off personally, I'm sure if you were a fan you wouldn't be disappointed. The selection of desserts we tried were nothing to write home about although there is something entertaining about watching people try to eat too-big-for-one-go wontons with hot molten chocolate inside. Large groups of 8-12 can also choose to order Slow Roast Pork or Beef at £100/£130 with a selection of sides which is pretty good value and if the meat dishes we tried are a taster of this, then this would be a real hit. Wine prices were actually a little on the cheeky side, with very few reasonably priced reds (one of which was unavailable on the night). Better selection and price variety on the whites but still quite an enthuiastic mark up. You'd be better off sticking to Sake and beer. 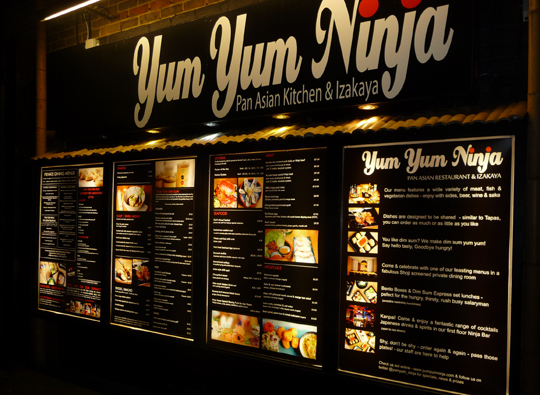 On the whole though, I think Yum Yum Ninja is a must visit in the city. I could easily return a number of times to polish off the whole menu. We didn't touch the Chargrilled Bincho Sticks or Soups that I want to try and apparently the Baked Puff Dim Sum are really something. This place verges just about on the right side of cool and despite the out of the way location and questionable interior, I think it's a place that will do well if the food variety and quality bar they have set stays firmly put.